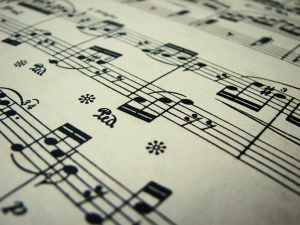 The term sonata applies to a variety of musical works. The Sonata (from Latin and Italian sonare, "to sound"), in music, literally means a piece played as opposed to a cantata (Latin and Italian cantare, to sing), a piece sung. The term, being vague, naturally evolved through the history of music, designating a variety of forms prior to the Classical music era. The term would take on increasing importance in the Classical period, and by the early nineteenth century, the word came to be used for a principle of composing large scale works, and be applied to most instrumental genres, regarded alongside the fugue as one of two fundamental methods of organizing, interpreting and analyzing concert music. In the twentieth century the term continued to be applied to instrumental works, but the formal principles enunciated and taught through the nineteenth century were weakened or loosened. The Baroque era applied the term sonata to a variety of works, including works for solo instrument such as keyboard or violin, and for groups of instruments. In the transition from the Baroque to the Classical period, the term sonata underwent a change in usage, from being applied to many different kinds of small instrumental work to being more specifically applied to chamber music genres with either a solo instrument, or a solo instrument with piano. Increasingly after 1800, the term applies to a form of large-scale musical 'argument', and it is generally used in this sense in musicology and musical analysis. Most of the time, if some more specific usage is meant, then the particular body of work will be noted: for example the sonatas of Beethoven will mean the works specifically labelled sonata, whereas Beethoven and sonata form will apply to all of his large-scale instrumental works, whether concert or chamber. In the twentieth century, sonatas in this sense would continue to be composed by influential and famous composers, though many works which do not meet the strict criterion of "sonata" in the formal sense, would also be created and performed. In the Baroque music period, a sonata was composed for one or more instruments almost always with a figured bass or continuo. After the Baroque, most works designated as sonatas specifically are performed by a solo instrument, most often a keyboard instrument, or by a solo instrument together with a keyboard instrument. In the late Baroque and early Classical period, a work with instrument and keyboard was referred to as having an 'obbligato' part, in order to distinguish this from use of an instrument as a continuo, though this fell out of usage by the early 1800s. Beginning in the early nineteenth century, works were termed sonata if, according to the understanding of that time, they were part of the genre, even if they were not designated sonata when originally published, or by the composer. A related term at the time was "Fantasia" or "Fantasie," which was applied to movements or works which had a much freer form than the Sonata (for example Schubert's Wanderer Fantasy). In the Classical period and afterwards, sonatas for piano solo were the most common genre of sonata, with sonatas for violin and piano or cello and piano being next. However, sonatas for a solo instrument other than keyboard have been composed, as have sonatas for other combinations of instruments, and for other instruments with piano. By the time of Arcangelo Corelli, two polyphonic types of sonata were established: the sonata da chiesa (church sonata) and the sonata da camera ("ordinary" sonata, literally chamber sonata). The sonata da chiesa, generally for one or more violins and bass, consisted normally of a slow introduction, a loosely fugued allegro, a 'cantabile' slow movement, and a lively finale in some binary form suggesting an affinity with the dance-tunes of the suite. This scheme, however, was not very clearly defined, until the works of Johann Sebastian Bach and George Friderich Handel, when it became the essential sonata and persists as a tradition of Italian violin music, even into the early nineteenth century, in the works of Boccherini. The sonata da camera had consisted almost entirely of idealized dance-tunes, but by the time of Bach and Handel, such a composition drew apart from the sonata, and came to be called a suite, a partita, an ordre, or, when it had a prelude in the form of a French opera-overture, an overture. On the other hand, the features of the sonata da chiesa and sonata da camera tended to be freely intermixed. Bach; however, while not using the titles themselves, nevertheless, kept the two types so distinct that they can be recognized by style and form. Thus, in his Sonatas and partitas for solo violin (numbers 1001-1006) and six solo violin sonatas, Numbers 1, 3, and 5 are recognizably sonate de chiesa, and Numbers 2, 4, and 6 are explicitly called partitas, but are admissible among the sonatas as being 'sonate da camera'. Bach is also cited as being among the first composers to have the keyboard and solo instrument share a melodic line, whereas previously, most sonatas for keyboard and instrument had kept the melody exclusively in the solo instrument. The term sonata is also applied to the series of solo keyboard sonatas by Domenico Scarlatti (over 500 works) for harpsichord solo, or sometimes for other keyboard instruments, originally published under the name Essercizi per il gravicembalo (Exercises for the Harpsichord). Most of these pieces are in a binary form movement only, with two parts that are in the same tempo and use the same thematic material, though occasionally there will be changes in tempo within the sections. Many of the sonatas were composed in pairs, one being in the major and the other in the parallel minor. They are frequently virtuosic, and use more distant harmonic transitions and modulations than were common for other works of their time. They are admired for their great variety and invention. The genre—particularly for solo instruments with just the 'continuo' or 'ripieno'—eventually influenced the solo movements of suites or concerti that occurred between movements with the full orchestra playing, for example in the Brandenburg Concerti of Bach. The trio sonatas of Vivaldi, too, show parallels with the concerti he was writing at the same time. The sonatas of [[Pietro Domenico Paradisi (Paradies) are mild and elongated works of this type, with a graceful and melodious little second movement included. The manuscript on which Longo bases his edition of Scarlatti frequently shows a similar juxtaposition of movements, though without any definite indication of their connection. The style is still traceable in the sonatas of the later classics, whenever a first movement is in a uniform rush of rapid motion, as in Mozart's violin sonata in F (Köchel-Verzeichnis 377), and in several of Clementi's best works. The practice of the Classical music era would become decisive for the sonata. The sonata term moved from being one of many terms indicating genres or forms, to designating the fundamental form of organization for large-scale works. This evolution stretched over 50 years. The term came to apply both to the structure of individual movements (see Sonata form and History of sonata form) and to the layout of the movements in a multi-movement work. In the transition to the Classical period, there were several names given to multimovement works, including 'divertimento', 'serenade', and 'partita', many of which are now regarded effectively as sonatas. The usage of sonata as the standard term for such works began somewhere in the 1770s. Haydn labels his first piano sonata as such in 1771, after which the term divertimento is used very sparingly in his output. The term sonata was increasingly applied to either a work for keyboard alone (see Piano sonata), or for keyboard and one other instrument, often the violin or cello. It was less and less frequently applied to works with more than two instrumentalists, for example piano trios were not often labelled sonata for piano, violin, and cello. A middle movement which was, most frequently, a slow movement: an Andante, an Adagio, or a Largo; or, less frequently, a Minuet, Variation or Theme and Variations form. A closing movement, early in the period sometimes a minuet, as in Haydn's first three piano sonatas, but afterwards, generally an Allegro or a Presto, often labelled Finale. The form was often called a 'Rondo'. However, two-movement layouts also occurred, a practice Haydn uses as late as the 1790s. There is also, in the early Classical period, the possibility of using four movements, with a dance movement inserted before the slow movement, as in Haydn's Piano sonatas Number 6 and Number 8. Mozart's sonatas would also be primarily in three movements. Of the works that Haydn labelled piano sonata, divertimento, or partita in Hob XIV, seven are in two movements, 35 are in three movements, and 3 are in four movements; and there are several in three or four movements whose authenticity is listed as "doubtful." Composers such as Boccherini would publish sonatas for piano and obbligato instrument with an optional third movement—in Boccherini's case, 28 Cello sonatas. But increasingly instrumental works were laid out in four, not three movements, a practice seen first in string quartets and symphonies, and reaching the sonata proper in the early sonatas of Beethoven. However, two- and three-movement sonatas continue to be written through out the Classical period: Beethoven's opus 102 pair has a two-movement C major sonata and a three-movement D major sonata. A slow movement, an Andante, Adagio, or Largo. A finale in faster tempo, often in a rondo or sonata–rondo form. This four-movement layout came to be considered the standard for a sonata, and works without four movements, or with more than four, were increasingly felt to be exceptions; they were labelled as having movements "omitted," or had "extra" movements. Movements when they appeared out of this order would be described as "reversed," such as the Scherzo coming before the slow movement in Beethoven's 9th Symphony. This usage would be noted by critics in the early 1800s, and it was codified into teaching soon thereafter. It is difficult to overstate the importance of Beethoven's output of sonatas: 32 piano sonatas, plus sonatas for cello and piano and violin and piano, forming a large body of music which would over time increasingly be thought essential for any serious instrumentalist to master. In the early nineteenth century, conservatories of music were established, leading to a codification by critics, theorists and professors of the practice of the Classical period. In this setting, our current usage of the term sonata was established, both as regards form per se, and in the sense that a fully elaborated sonata serves as a norm for concert music in general, which other forms are seen in relation to. Carl Czerny declared that he had invented the idea of sonata form, and music theorists began to write of the sonata as an ideal in music. From this point forward, the word sonata in music theory as often labels the abstract musical form as well as much as particular works. Hence there are references to a symphony as a sonata for orchestra. This is referred to by William Newman as the sonata idea, and by others as the sonata principle. Among works expressly labelled sonata, some of the most famous were composed in this era. There is the "Funeral March" sonata of Chopin, the sonatas of Mendelssohn, the three sonatas of Robert Schumann, those of Franz Liszt, and later the sonatas of Johannes Brahms and Sergei Rachmaninoff. In the early nineteenth century, the sonata form was rigorously defined, from a combination of previous practice and the works of important Classical composers, particularly Haydn, Mozart, Beethoven, but composers such as Clementi also. Works not explicitly labelled sonata were nevertheless felt to be an expression of the same governing structural practice. Because the word became definitively attached to an entire concept of musical layout, the differences in Classical practice began to be seen as important to classify and explain. It is during this period that the differences between the three- and the four-movement layouts became a subject of commentary, with emphasis on the concerto being laid out in three movements, and the symphony in four. Many thought that the four movement form was the superior layout. The concerto form was thought to be Italianate, while the four-movement form's predominance was ascribed to Haydn, and was considered German. This view, that the sonata is truly only at home in the Classical style, and had become a road block to later musical development, is one that has been held at various times by composers and musicologists, including recently by Charles Rosen. In this view the sonata called for no explicit analysis in Haydn, Mozart, and Beethoven's era, in the same sense that Bach "knew" what a fugue was and how to compose one, whereas later composers were bound by an "academic" sense of form that was not well suited to the Romantic era's more frequent and more rapid modulations. The sonata was closely tied in the Romantic period to tonality, harmony, and practice. Even before the demise of this practice, large-scale works increasingly deviated from the four-movement layout that had been considered standard for almost a century, and the internal structure of movements began to alter as well. The "sonata idea," along with the term sonata itself, continued to be central to musical analysis, and a strong influence on composers, both in large-scale works and in chamber music. The role of the sonata as an extremely important form of extended musical argument would inspire composers such as Paul Hindemith, Sergei Prokofiev, Dmitri Shostakovich to compose in sonata form, and works with traditional sonata structures continue to be composed and performed. The piano sonatas of Scriabin would begin from standard forms of the late Romantic period, but would progressively abandon the formal markers that had been taught, and would usually be composed as single-movement works; he is sometimes thought of as a composer on the boundary between Romantic and modern practice of the sonata. Charles Ives's massive Piano Sonata No. 2 (Concord Sonata 1920) for piano bore little resemblance to the traditional Sonata. It had four movements (though not with the usual tempos), very few barlines, and the tonality, where present, is fleeting or often compounded with polytonality. It even contained optional (and very minor) parts for viola and flute. Still later, Pierre Boulez would compose three piano sonatas in the early 1950s, which, while they were neither tonal nor laid out in the standard four-movement form, were intended to have the same significance as sonatas. Elliot Carter began his transition from neo-classical composer to avant-garde with his Cello Sonata. The development of the classical style and its norms of composition formed the basis for much of the music theory of the nineteenth and twentieth centuries. As an overarching formal principle, sonata was accorded the same central status as Baroque fugue; and generations of composers, instrumentalists, and audiences were guided by this understanding of sonata as an enduring and dominant principle in Western music. The sonata idea begins before the term had taken on its present importance, along with the evolution of the Classical period's changing norms. The reasons for these changes, and how they relate to the evolving sense of a new formal order in music, is a matter to which research is devoted. Some common factors which were pointed to include: the shift of focus from vocal music to instrumental music; changes in performance practice, including the loss of the continuo and the playing of all movements of a work straight through, without "mechanical" repeats; the shift away from the idea that each movement should express one dominant emotion (see Affect (psychology)), to a notion of accommodating contrasting themes and sections in an integrated whole; the move from a polyphonic mode of composition to a homophonic mode; changes in the availability of instruments, and new technical developments in instruments; the obsolescence of straightforward binary organization of movements; the rise of more dance rhythms; and changes in patronage and presentation. Crucial to most interpretations of the sonata form is the idea of a tonal center; and, as the Grove Concise Dictionary of Music puts it: "The main form of the group embodying the 'sonata principle', the most important principle of musical structure from the Classical period to the twentieth century: that material first stated in a complementary key be restated in the home key." The sonata idea has been thoroughly explored by William Newman in his monumental three-volume work Sonata in the Classic Era (A History of the Sonata Idea), begun in the 1950s and published in what has become the standard edition of all three volumes in 1972. He notes that according to his research, theorists had generally shown "a hazy recognition of 'sonata form' during the Classical Era and up to the late 1830s" and places particular emphasis on Reicha's 1826 work describing the "fully developed binary form," for its fixing of key relationships, Czerny's 1837 note in the preface to his Opus 600, and Adolph Bernhard Marx, who in 1845 wrote a long treatise on sonata form. Up until this point, Newman argues, the definitions available were quite imprecise, requiring only instrumental character and contrasting character of movements. William Newman also notes, however, that these codifications were in response to a growing understanding that the eighteenth century did have a formal organization of music. Before those publications of Reicha, Czerny, or Marx, there are references to the "customary sonata form," and in particular to the organization of the first movement of sonatas and related works. He documents the evolution of sonata analysis as well, showing that early critical works on sonatas, with some very notable exceptions, dealt with structural and technical details only loosely. Instead, many important works belonging to the sonata genre, or in sonata form, were not analyzed comprehensively in terms of their thematic and harmonic resources until the twentieth century. Two of the most important theorists in European musicology of the twentieth century, Heinrich Schenker and Arnold Schoenberg, both had ideas of central importance for the analysis and general understanding of the sonata. Their ideas were extremely rigorous, and placed tremendous emphasis on the long range influence of tonal materials. Both advanced theories of analysis of works which would be adopted by later theorists. While the two men disagreed with each other, their ideas have often been used in combination. Heinrich Schenker argued that there was an Urlinie or basic tonal melody, and a basic bass figuration. He held that when these two were present, there was basic structure, and that the sonata represented this basic structure in a whole work with a process known as interruption. Arnold Schoenberg advanced the theory of monotonality, according to which a single work should be played as if in one key, even if movements were in different keys, and that the capable composer would reference everything in a work to a single tonic triad. For Schenker, tonal function was the essential defining characteristic of comprehensible structure in music, and his definition of the sonata form rested, not on themes groups or sections, but on the basic interplay between the different "layers" of a composition. For Schoenberg, tonality was not essential to comprehensibility, but he accorded similar importance to the structural role of notes, in "explaining" the relationships of chords and counterpoint in musical structure. Both theorists held that tonality, and hence sonata structure in tonal form, is essentially hierarchical: what is immediately audible is subordinate to large-scale movements of harmony. They argued that transient chords and events are less significant than movement between certain crucial underlying chords. This page was last modified on 11 October 2015, at 15:35.